I had heard of Mr. Lessig a couple of years back. But I never took it upon myself, to dive deeper, and truly discover the man behind the movement. Upon seeing the video posted at the bottom, I decided it was about time I got a better idea. Considering his broad based thinking and the influence he has had and continues to have on the world, I figured he had probably attended TED. So this was my first stop, Ted.com. 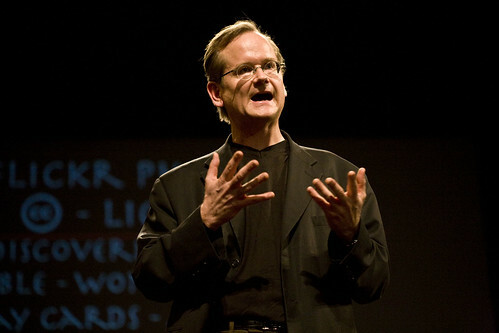 And I was in luck, as there was one recorded Larry Lessig presentation, from last years TED ’07. Which you can find here. This is a great introducing to his ideas and is basically a TED friendly / slimmed down version of his famous Free Culture presentations; which, after finishing the TED presentation, I went looking for. To the best of my knowledge, I found a full featured Free Culture presentation here. First off, this guy has a remarkable way to deliver his presentations. The combination of words, images, video and his personal delivery is like nothing I have experienced in a presentation, it really is awesome. I guess to some it coudl be annoying, but I am a total fan. Anyways, all I can say so far is, I believe, or I at least want to believe. Lessig has some simple but game changing ideas outlined in the video posted at the bottom. Check it all out for yourself, but Lessig could really be onto something here, in terms of changing the way in which our government works that is. Instead of relisting all of this, because it’s 8:45 am and I’ve yet to hit the z’s, a quick post with links to additional content on Lessig can be found at O’Reilly Radar.